What are the best ways to get around Europe? Once you get to your destination, how you get around can really change how you see a country. It's more than just a way to get from point A to point B. How you choose to get around can really change what you see and even how much you can see. Here we will talk about the different options and things to look for. Maybe you decide to step outside your comfort zone and try something different. In the end, it's all up to you. If you want to jump ahead and start booking click here! In this section we'll be talking about the different way to get around Europe available to you. They all have their own advantages and disadvantages. You will probably be using a combination of ways to get around. What you choose may depend on what you want to see, what your budget is, and where you plan on staying. Looking to book transportation for your trip? Regional trains in Europe are great. They can get you around quite fast, at a reasonable cost, and great comfort. If you are a planner, maybe the Eurail pass is an option for you. This is only for non-Europeans. There are many options such as Explore 5 countries within a month (more options available), or one country or up to four bordering countries. You can really pick a plan that suits your itinerary. Learn more here about the Eurail options and how to pick the best one for you. Are you under 27 years old? Then you save 20%. Traveling with kids? Kids between 4-11 years old travel for free. See the current deals here! Eurail has the best deals for non-Europeans and so many different options. Definitely one of the most cost-effective options. Omio (formerly Go Euro) is one of the best sites to find and book single tickets for trains within Europe. They will find you all the routes and even compare with flights and buses. If you just plan on taking the train once in a while, then look directly at rail provider website. That being said, check who is operating the train. For example I needed a train from Graz, Austria to Hamburg, Germany. On Deutsche Bahn's website the cheapest I could find was 129€. I checked ÖBB (Austrian Rail), I got on the exact same DB train for 60€. Deutsche Bahn, for example, has many options that you may miss if you just plug in a "to and from". They have inter-regional deals, weekend deals and more. So really explore the all websites for deals, and discount cards. In order to find reasonably price trains, it's best to start looking and booking about 3 months in advance. Waiting until the last minute can be quite expensive. Just be aware that sometimes the websites start in English and then switch to the local language at the time of booking. Looking to book a train for your trip? I love subways. I come from a city without subways, where waiting outside for a bus for 30 minutes in -30°c is a reality. Subways get you around the city fast. I always get a day pass or a 3-day pass. 7-day passes are also available. Deutsche Bahn allows you to pay a little extra to use local transit for free with your train ticket the day you arrive or depart. Every city will be different. London has an Oyster Visitor Card where you get a discounted rate on Metro. The reason I get a day pass is that I can hop on and off all day. Many cities have different zones for their metro, so be aware where you are traveling and what it costs. Do your research in advance. May cities have a discount pass on public transport, and they also give you discounts to some of the tourist attractions. Using Google Maps will help immensely finding and planning a route. If you are traveling with a smartphone, download the local public transit app. There it will tell you what bus/train to take and you can purchase tickets right on the app too often. They will have maps available too. One of my favourite apps is City Mapper, that uses GPS to track you, helping you find the bus stop, and even sending you an alert a stop in advance telling you when to get off. It's great for route planning, saving favourite locations to really make using public transit stress-free. It's not available in every city, so check first. If you don't mind leaving your location services on your phone, Google Now is great at finding your way back. It gets to learn your habits (a little creepy), and knows where you are staying and will tell you what buses to get back home. I used it a lot and loved it. I didn't have to think, just look at my phone. Flying within Europe is definitely the quickest way to get around. As for the cost, it can be comparable to taking the train if you know what to look for. There are lots of budget airlines that can get you around for under 100€. Just be careful and read all their fine print. Some will charge you to print off a ticket at the airport. Checked luggage can cost you much more than your ticket. So that 49€ flight, can now become 149€. One of the best sites for booking flights within Europe is Omio (formerly Go Euro). They are my goto for checking transportation within Europe. For example Ryanair has a flight from Berlin to London for 23€. If you forget to check in advance, look at paying 50€. I've read stories also of airlines separating people if they don't have reserved seats (read here). Of course this is not intentional *cough*, but they really want you to pay the 2-3€ fee to reserve a seat. They do have an option for 84€ that includes reserved seating, and 20kg checked baggage, priority boarding. Just think, if anyone is getting bumped "if" they oversell the flight, is it the person paying 84€ or 23€? I'm not saying this to discourage you from booking with a low budget airline. Just do your homework and be prepared for anything. Also, know your baggage allowances before you book. Check here. To learn more on booking flights, check out my page on finding cheap flights to Europe. Looking to book flights for your trip? We are all good drivers, right? Yeah well, ask yourself that after driving in Europe. My first day driving there, I had to swerve in a traffic circle, to avoid a man, on a bike, eating an ice cream cone. Okay, that could happen anywhere, but I wasn't well versed in traffic circles. Driving in different countries provides different challenges. Germany has the speed of the Autobahn and German efficiency. The UK is driving on the left. Spain you will notice many cars might not have side mirrors left and bumpers are for.....well.... bumping. Drivers can be very aggressive. So educate yourself on what the rules are for each country you want to drive in, as well as the driving customs of the locals. Read my post all about how to avoid a nightmare here before you decide to rent a car. Driving allows you to do what you want when you want. That being said, I avoid driving in a big city if possible. Many large cities have a Park and Ride set up. So if I was visiting a city for the day, I would park at a Park and Ride just outside the city and take the train in. This saves you the headache of city traffic, and parking. Parking can be very frustrating and costly. Driving can take you to places you could never get to by train or bus. If you are traveling with more people it could be more economical than taking the train. Europe also has Ride Sharing. So someone is traveling from Paris to London and they have 3 extra seats in their car. Why not fill them up? So for that trip, for example, would cost between 32£ - 44£ for you to have seat. Drivers have profiles, ratings, review much like AirBnB. Blablacar is one of the biggest websites out there. Are you female and concerned about your safety? There is a Ladies Only side to it too. Booking a car can be as complex as finding a flight. It can be costly, and always make sure you know what you are getting, especially when it comes to insurance. One thing to be aware of is, that booking on a site from out of country can be much cheaper! My friend was in Germany, walked into a car rental place, and they quoted her 400€ for two days plus they would put a freeze 900€ on her credit card. I told her to check the North America rental site not the German sites and she found a car for $115 Canadian for three days. That's quite a difference. How much does a car rental cost in Europe? It really depends. 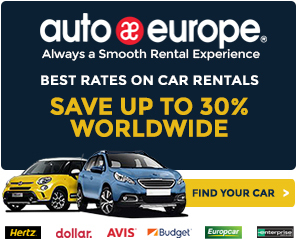 I like using AutoEurope because you can compare multiple car rental companies at once. Give it a try to see what a car rental would cost in Europe for your trip. Looking to rent a car for your trip? Buses that go from city to city can be a cheap way to get around. Now that being said, sometimes that cheap can cost you time. On longer trips there may be several stops. I once took a three hour bus ride from Hamburg to Berlin for 9€. The train would have taken 2 hours but cost three times as much. That's win in my books. I also took a 16 hour bus trip (one way) from Berlin to Vilnius, Lithuania return for 60€. That's a loss in my books. I could have saved myself 29 hours travel time flying for 120€. So really look at the distance you need to travel. If you are on a budget, maybe a bus is the way to go. For example, Paris to Munich by bus for 21 hours, you can find that for 33€. It's an overnight bus so you are saving on one night accommodation. Flying with Air France from Paris to Munich on the same day you can find starting at 65€ for a 1 hour 30 minute flight time. So decision time. With the bus you are saving 82€ if you factor in one night in an apartment. much more if you are staying in a hotel. Not going to lie, waking up in the morning on a bus to the Polish countryside was a memorable moment. It really depends what kind of traveller you are. I would start with FlixBus, as they have the most coverage in Europe. With over 1400 destinations in 26 countries this is why it's my goto place to look for bus tickets. They also have a deal for InterFlix 5 cities for 99€! Check it out here. Omio (formerly Go Euro) is another great site for buses. It also compares buses to flights and trains. Looking to book a bus on your trip? Locations - Common in major cities/around major sites to suburbs, and place the subway doesn't go. We probably have all taken a city bus at sometimes in our lives. Buses can be slow, and you have to have knowledge of the route so you know where to get off. Planning in advance will really make this much easier. Using Google Maps will help immensely finding and planning a route. If you are traveling with a smartphone, download the local public transit app. There it will tell you what bus/train to take and you can purchase tickets right on the app too often. They will have maps available too. One of my favourite apps is City Mapper, that uses GPS to track you, helping you find the bus stop, and even sending you an alert a stop in advance telling you when to get off. It's great for route planning, saving favourite locations to really make using public transit stress-free. It's not available in every city, so check first. If you don't mind leaving your location services on your phone, Google is great at finding your way back. It gets to learn your habits (a little creepy), and knows where you are staying and will tell you what buses to get back home. I used it a lot and loved it. I didn't have to think, just look at my phone. Taxis and Uber are generally a quick, efficient way to get around. You don't have to know how to get there, just give them an address. Of course this comes at a cost. If you are sharing a Taxi with others, it can be cost effective. I've often travelled by myself, and am very comfortable with public transit, even with a suitcase. Most airports are not in the city. A taxi will generally run you about 50€ one way from the airport to city centre. Using public transit can be between 9-10€ for the same trip. For door to door service, a taxi can be the way to go. Distances - How ambitious are you? Biking in a city can be quite a great way to get around. The harder part will be finding one. Some bike shops will rent by the day anywhere between 12€ - 18€ approximately. Deutsche Bahn even has a bike rental program in the major cities. So you can arrive by train and if you are registered you can rent a bike. Most major cities now have the pay-per-use bikes. You have to register in advance, and then pay for the time used. Usually based per half hour and/or daily rates. There are at stations in various locations around the city, so you can use the bike to get between locations, and they stop charging when you return the bike to a station. If you are looking at renting an apartment through AirBnB/Wimdu/VRBO, sometimes a bike could be included. I had the fortune of finding a place like that in Graz. So for four days I had a bike, which was invaluable for getting around, all included in the rental of the place. That will be a little trickier to find, but they are out there. There are different ways to take a ship. I mainly look at it as a unique experience, not a cost effective way to get around. There are cheaper boat tours that take you around rivers and canals for the day. Hamburg has ferries you can take around the harbour for the cost of public transit, which is nice to do for a cheap cost. There are many cruises around Europe. You can tour the Fjords of Finland for 4 days, which will set you back about 350€ and up. Smyril Lines run to and from Iceland from the Faroe Islands, Denmark and other places. Denmark to Iceland one way in a bunk in an 8 person room will set you back about 275€ not including meals for the 3 day trip. Cruise on popular river routes like the Rhine for 7 days, start at about 800€ to well over 3500€. Look into some of the ferries crossing bodies of water. Tallinn, Estonia to Helsinki, Finland across the Baltic Sea can be as low as 18€. Popular routes like Dover, England to Calais, France can be done for approximately 35€. These prices are quite reasonable to have a different experience on your trip. Ferries can also accommodate a vehicle. For example a small car, from Tallinn to Helsinki starts at around 35€, and Dover to Calais 65€, just to give you an idea. Definitely something to look into for another option. Looking to book a ferry on your trip?